Full Moon, 2007, still from a color video with sound, 23 minutes. Lamia Joreige’s exhibition is the first held in the Kettaneh Building, two floors of which were renovated expressly for the occasion and which might soon hold a more permanent gallery. In the airy, bright, and welcoming street-level area, Joreige presents her installation Nights and Days, 2006, in which short texts are coupled with photographs of urban and more rural landscapes in order to form a series of personal observations. While these prints cannot avoid illustrating traces of war and violence, they also, when read in relation to one another, suggest a variety of narratives involving love, desire, and loss. The notion of narrative as combinative is also explored in Je d’histoires (I Am Histories), 2007. Consisting of a computer keypad and a plasma screen, the work offers viewers the opportunity to combine images, sounds, and texts in various ways to play out, in video, open-ended tales told from multiple perspectives. 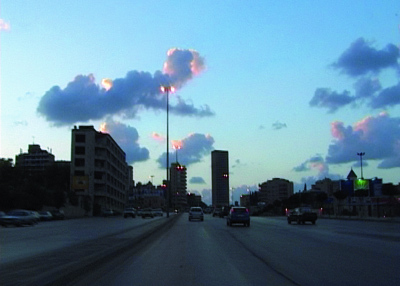 For Full Moon, 2007, Joreige herself enacts variations on one story in which she seeks to re-encounter an extraordinary full moon she once saw, but did not record, hanging over Beirut. In order to capture a scene similar to the one in her memory, Joreige repeated the journey on several full-moon evenings, each time equipped with a video camera. Only once does she capture the natural phenomenon in all its strength, but more compelling than this footage are the accompanying audio news clips, which were recorded on each of the days she embarked on her quest. While the viewer listens to the news from key days before and during the 2006 Lebanon War and to more recent broadcasts discussing the repeated postponement of the Lebanese presidential elections, the poetry no longer comes from anticipating the image of the moon, but from the relationship between the universal cycles of nature and the earthly repetition of human suffering.